MIAMI — Two years ago, immigration activist Gaby Pacheco got a call from Marco Rubio. The Florida senator wanted advice as he tried to develop a plan to help people like her: immigrants brought to the United States illegally as children. Now, Pacheco is aghast that Rubio is taking a harder line on illegal immigration. The potential 2016 Republican presidential candidate has abandoned the sweeping bill he helped write and is calling for an end to the Obama administration program that lets Pacheco stay in America. “It’s another Marco Rubio that I just don’t know,” she said. After the first-term senator saw his political standing fall among conservatives who balked at his immigration advocacy, Rubio is now focusing on border security – more in line with the GOP activists who wield great influence in how a White House nominee is picked. Rubio’s aides say the senator always has stressed border security and that he insisted on tougher enforcement measures as a condition for his Senate vote last year. But immigrant advocates contend that in emphasizing only border security and dismissing his own bill, Rubio is effectively switching sides in the heated debate. The shift comes as potential 2016 rivals such as Sens. Ted Cruz of Texas and Rand Paul of Kentucky, who voted against the overhaul that Rubio helped write, take hard-line stands on immigration. Rubio has begun visiting South Carolina and Iowa, early-voting states in the 2016 nominating calendar where immigration is an important test for White House hopefuls. Rubio was the only potential GOP candidate who helped write the immigration bill, which would strengthen border security while also offering a way to citizenship for many of the 11.5 million people who are in the U.S. illegally. The bill remains poisonous among some in the Republican base, and Rubio’s popularity has plummeted in public polls. In a series of appearances on Fox News and conservative talk radio, Rubio has embraced GOP calls to bolster security and deploy the National Guard along the Mexican border to respond to the arrival of tens of thousands of Central Americans. On a recent tour through central Florida, an important swing-voting region with a fast-growing Latino population, Rubio told reporters in English and Spanish that his emphasis on border security is an acknowledgement that House conservatives do not support a comprehensive immigration bill. At the Orange County Republican Party’s Lincoln Day dinner, that argument resonated with many activists who propelled Rubio to the Senate four years ago. But the tough talk also threatens to undercut Rubio’s credibility with Hispanic voters, a critical factor for the Cuban-American lawmaker in a country that has yet to elect a Latino president. Rubio has often felt the competing pressures from the Hispanic community and the conservative activists who elevated him to the national stage. Rubio spent months meeting with Pacheco and other immigrant advocates. Obama pre-empted those efforts by announcing an executive action to temporarily defer deportations and grant work permits to hundreds of thousands of immigrants who were brought to the country illegally as children. 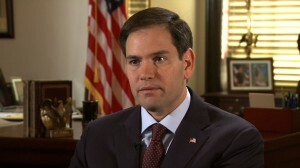 When asked whether he supported a House bill that would effectively phase out Obama’s executive order, however, Rubio cited concerns about the “unintended consequences” for youths who have already come forward and obtained work permits.